PR Manager	Marketing & Sales LINE-X Franchise Development Corp.
SANTA ANA, Calif., June 10, 2009 – LINE-X® Franchise Development Company, one of the nation’s leading providers of spray-on protective coatings, is proud to announce the company is partnering with Truck Covers USA to introduce the new American X-Box. The American X-Box combines the top of the line tool box created by Truck Covers USA for their American Work Cover with the protection of LINE-X® XTRA, a spray-on urethane coating fortified with DuPont™ KEVLAR®. The American Work Cover by Truck Covers USA unites a tool box and American Roll Cover creating a marriage of the highest product qualities. 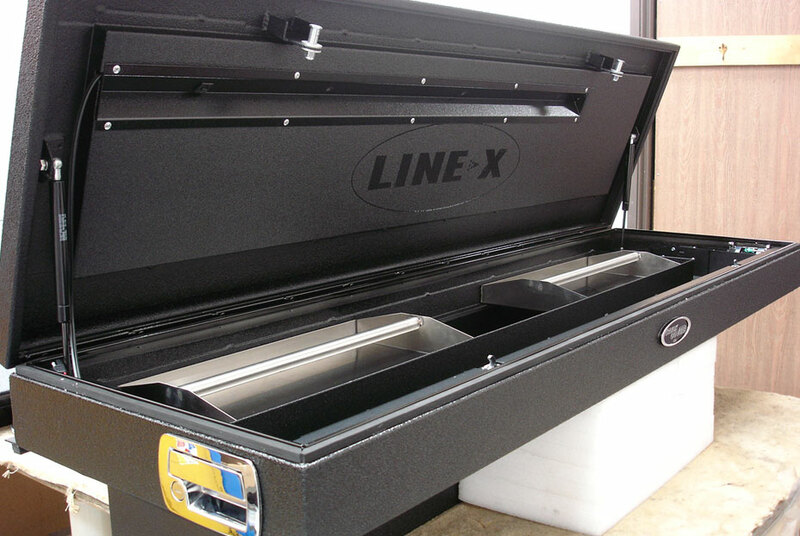 LINE-X XTRA permanently bonds to the heavy-duty galvanized sheet metal sectioned tool box providing a weather tight seal to protect against extreme heat, cold, moisture, abrasion and rust, while the increased tensile strength rating resists scratches, gouges and punctures. The American X-Box enhances the look of any work truck with convenience and ease of use, while providing protection and security like no other. A tool box and truck cover that really works! The new American X-Box is available through Truck Covers USA dealers and through participating LINE-X locations throughout the company’s network of more than 500 professional application centers in the United States and Canada. For more information, visit: www.LineX.com or www.TruckCoversUSA.com/html/xbox.html. Truck Covers USA (http.truckcoversusa.com) is the leading provider of superior truck covers and tool boxes in the United States using tomorrow’s technology and innovation while competing at today’s prices. Truck Covers USA is known for its highly trained staff, cutting edge design, state of the art materials and undivided attention to the smallest details. LINE-X Protective Coatings (www.LineX.com) is an industry leader in high performance protective coatings offering specifically formulated polymers that permanently bond to a wide range of surfaces for unmatched durability. LINE-X products are used in automotive, commercial, light industrial, heavy industrial, agricultural, military, marine and custom applications. Headquartered in Santa Ana, California, with more than 500 locations in 26 countries, LINE-X is focused on creating new protective coatings for a wide range of retail, industrial and other applications needing extreme protection.